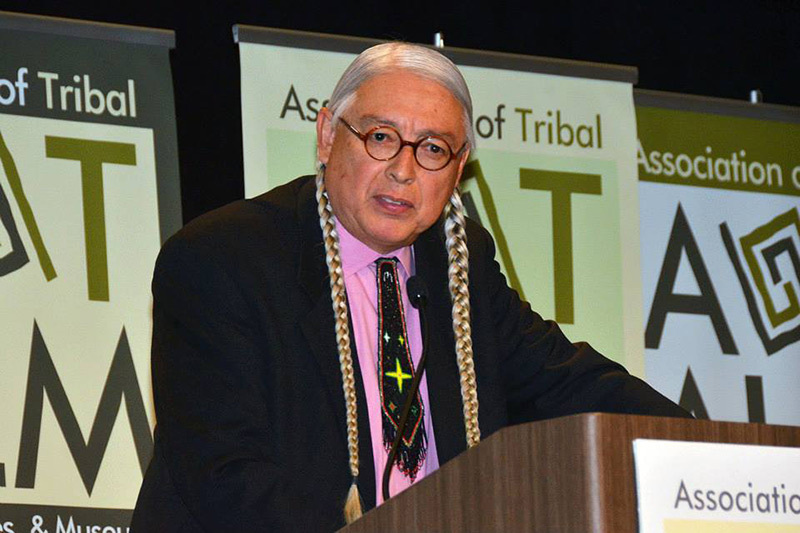 2019 Trudell lecturer Walter R. Echo-Hawk is a Pawnee Nation citizen who has served throughout Indian Country as an attorney, Tribal judge, author, activist, historian, and law professor; March 1. The fourth Trudell lecturer is Walter R. Echo-Hawk, a Pawnee Nation citizen who has served throughout Indian Country as an attorney, Tribal judge, author, activist, historian, and law professor. His talk is entitled, "Native American Human Rights & Civil Rights Experience in the U.S."
Since 1973, he has represented Native Nations on critical legal issues, such as treaty rights, water rights, religious freedom, prisoner rights, and repatriation rights with the Native American Rights Fund. His career spans the pivotal years when Indian Tribes reclaimed their land, sovereignty, and pride in a stride toward freedom. He was instrumental in the passage of landmark federal legislation including the Native American Graves Protection and Repatriation Act (1990) and amendments to the Native American Religious Freedom Act (1994). He is the author of many articles and books on the subject of Indigenous rights including: Sea of Grass: A Family Tale from the American Heartland (2019); In The Light of Justice: The Rise of Human Rights in Native America and the UN Declaration on the Rights of Indigenous Peoples (2013); In The Courts of the Conqueror: The 10 Worst Indian Law Cases Ever Decided (2010); and Battlefields and Burial Grounds: The Indian Struggle to Protect Ancestral Graves in the United States(1996). The Trudell Lecture was launched in 2015 following the untimely death of John Trudel, a beloved actor, writer, musician, leader and activist for Indigenous rights. Trudell was a Vietnam War veteran and is perhaps best known for his role as a spokesperson for the organization Indians of All Tribes during their nineteen month takeover of the Alcatraz Prison in 1969. The lecture is sponsored by the UNO Department of History, Native American Studies program, Western History Association and Sam & Frances Fried Holocaust & Genocide Academy.